What is Certified California Sustainable Winegrowing (CERTIFIED SUSTAINABLE)? What are CERTIFIED SUSTAINABLE requirements? Why is continuous improvement a CERTIFIED SUSTAINABLE requirement? Why are the first-year requirements for CERTIFIED SUSTAINABLE different than the second year and beyond? How do I find CERTIFIED SUSTAINABLE wineries, vineyards and wine? What do the CERTIFIED SUSTAINABLE logos mean? What is required to use the circular CERTIFIED SUSTAINABLE logo on the wine label? How many California vineyards and wineries are CERTIFIED SUSTAINABLE? Who are the independent, third-party auditors? Does CERTIFIED SUSTAINABLE adhere to international sustainability protocols? Does sustainability influence purchasing decisions? How does sustainable winegrowing certification relate to organic and biodynamic certification? How does CERTIFIED SUSTAINABLE address pest management? What is the difference between Integrated Pest Management and Organic? 1. What is Certified California Sustainable Winegrowing (CERTIFIED SUSTAINABLE)? Introduced in 2010 by the California Sustainable Winegrowing Alliance (CSWA), CERTIFIED SUSTAINABLE is a statewide certification program that provides third-party verification that a winery and/or vineyard adopts and implements stringent sustainable winegrowing requirements based on the industry’s code of best practices, and commits to continuous improvement in those areas. As of January 2017, a new CERTIFIED SUSTAINABLE wine logo is available for use on wine labels of CERTIFIED SUSTAINABLE wineries using 85% or more grapes from certified vineyards and 100% of grapes from California. 2. What are CERTIFIED SUSTAINABLE requirements? Complete an annual self-assessment of 140 vineyard and 104 winery best practices using the California Code of Sustainable Winegrowing. Meet 58 vineyard and 37 winery prerequisite practices. Exceed an overall score threshold of 85% of scores being Category 2 or higher on a 1-4 scale by the second year of certification. Implement an Integrated Pest Management approach and comply with restrictions on crop protection materials as required by CSWA’s Red and Yellow Lists. Materials on the Red List may not be used by the second year of certification; and while materials on the Yellow List may be used, alternatives must first be tried or considered, and justification and mitigation of risk documented. Measure and record sustainability performance metrics including water, energy, and GHGs for wineries, and water and applied nitrogen for vineyards by the second year of certification. Prioritize, develop and implement action plans to continuously improve. Wine bearing the CERTIFIED SUSTAINABLE logo or claims must be made in a certified winery, using at least 85% grapes from certified vineyards and 100% from California, and must undergo a successful chain of custody audit. The California Code of Sustainable Winegrowing is a comprehensive workbook that enables growers and vintners to evaluate over 200 sustainable practices from grape to glass. 3. Why is continuous improvement a CERTIFIED SUSTAINABLE requirement? In addition to meeting the minimum program requirements, all certified vineyards and wineries must demonstrate to an accredited auditor improvement in their sustainable practices on an annual basis. 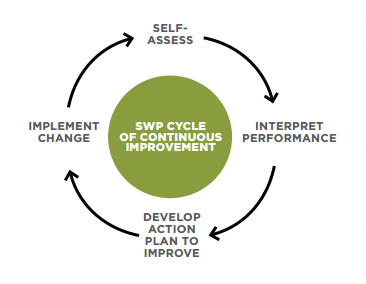 The continuous improvement requirement is based on the understanding that sustainability is a journey, not a destination and that no matter where a particular vineyard or winery is with their sustainability, incremental improvements to increase their efficiency, reduce resource use, or improve processes can always be made. Continuous improvement shows long-term commitment to sustainability and a willingness to find ways to increase efficiencies and conserve resources. 4. Why are the first-year requirements for CERTIFIED SUSTAINABLE different than the second year and beyond? Certified California Sustainable Winegrowing (CERTIFIED SUSTAINABLE) first year requirements include self-assessment, meeting prerequisite practices, and identifying and prioritizing action plans for improvement. By the second year of certification and beyond, participants must also meet a minimum score threshold, measure and record sustainability performance metrics and comply with restrictions on crop protection materials. Certified vineyards and wineries have one “ramp-up” year to meet all of the certification requirements, which are required for any wine bearing the CERTIFED SUSTAINABLE logo. This provides certified applicants with the opportunity to commit to formalizing their sustainability efforts through achieving certification and meeting Year One requirements, but allows adequate time to fulfill the additional Year Two requirements, which must be met for use of the CERTIFIED SUSTAINABLE logo/claims on the wine label bottle. 5. How do I find CERTIFIED SUSTAINABLE wineries, vineyards and wine? CSWA maintains a list of all the CERTIFIED SUSTAINABLE wineries and vineyards on its website. You can also look for certification logos and signs in vineyards, tasting rooms, websites, and promotional materials. Wines bearing the new CERTIFIED SUSTAINABLE logo for wine labels will begin appearing in the marketplace in 2018. 6. What do the CERTIFIED SUSTAINABLE logos mean? 7. What is required to use the circular CERTIFIED SUSTAINABLE logo on the wine label? In order to be eligible for the circular CERTIFIED SUSTAINABLE wine logo or to make certification claims on the bottle, certified wineries must undergo a Chain of Custody Audit that verifies all wine bearing the CERTIFIED SUSTAINABLE logo or label claims is made in a CERTIFIED SUSTAINABLE winery; 85% or more of the grapes are from certified vineyards (grapes can be sourced from CERTIFIED SUSTAINABLE, Lodi Rules and/or Sustainability In Practice Certified vineyards); 100% of grapes are from California; and the winery and vineyard(s) are meeting Year Two Certification Requirements. Wineries may opt not to use the logo or make claims on the label even if eligible, and instead choose to communicate certification status in other ways. 8. How many California vineyards and wineries are CERTIFIED SUSTAINABLE? As program numbers continue to increase after each audit cycle, please visit https://www.sustainablewinegrowing.org/CCSW-certifiedparticipants.php for the most up-to-date data. 9. Who developed the certification program? California Sustainable Winegrowing Alliance and its Sustainable Winegrowing Joint Committee (made up of over 50 growers and vintners who are members of Wine Institute and/or the California Association of Winegrape Growers) developed the certification program over the course of three years, and launched the vineyard and winery certification in 2010. The program also went through an extensive stakeholder review process in 2015-2016 to update the certification requirements to enable the use of the certification logo on the bottle (a communication method that was not previously available to certified participants). CSWA also worked closely with sustainability experts and with a dedicated group of stakeholders, including government agencies, academia, non-governmental organizations, and other experts during the development and update of the program. These stakeholders have also provided extensive review of all three editions of the California Code of Sustainable Winegrowing and the certification program. 10. Who are the independent, third-party auditors? 11. Does CERTIFIED SUSTAINABLE adhere to international sustainability protocols? CERTIFIED SUSTAINABLE has undergone a robust third-party assessment of its standard development process and assurance program by SCS Global Services, and has successfully demonstrated overall compliance with the requirements of an assessment framework based on the requirements of internationally recognized standards and assurance systems, including ISO/IEC Guide 59:1994, ISO/IEC 17065:2012, and ISEAL Credibility Principles. 12. Does sustainability influence purchasing decisions? Yes! Trade research, commissioned by CSWA and conducted by Wine Opinions in 2016, shows that a majority of the U.S. wine trade considers sustainability when making purchasing decisions. A majority of trade respondents who purchase and sell wine consider sustainable practices when selecting wines either frequently (24%) or occasionally (52%) in response to consumer demand, personal interest or as a selling feature. A majority of respondents to the poll felt that the addition of Certified on a label improves sales or marketability-by a lot (17%) and somewhat (50%). See the Press Release or download the survey summary: https://www.wineinstitute.org/resources/pressroom/05072013. 13. How does sustainable winegrowing certification relate to organic and biodynamic certification? Sustainable winegrowing can be viewed as an umbrella concept, where there is overlap with organic and biodynamic principles and practices, yet each have characteristics that make them unique. In addition to earth-friendly methods for vineyards and surrounding ecosystems, sustainability includes energy efficiency, protection of air and water quality, enhanced relations with employees and neighbors, environmentally preferred purchasing, among many others. 14. How does CERTIFIED SUSTAINABLE address pest management? CERTIFIED SUSTAINABLE Vineyards are required to have a robust Integrated Pest Management (IPM) approach in place to manage their pests and diseases. An IPM approach combines biological, cultural, mechanical and chemical tools (when needed) to minimize economic, environmental and human health risks when controlling pests and disease. There are 20 required practices that ensure an effective IPM program is implemented, which includes vineyard monitoring, employee training, minimizing risks, using cultural practices, efficient spray coverage, etc. There are 14 additional practices that help to ensure the IPM approach is comprehensive and addresses all relevant pest issues. 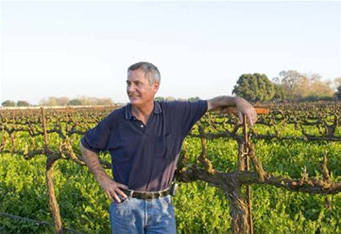 All of these certification requirements are in addition to the rigorous regulatory environment in California that restricts which materials can be applied to winegrapes, who can apply them and what training/licensing they must have and maintain, mandatory reporting of all pesticide use, worker safety, among other requirements. 15. What is Integrated Pest Management (IPM)? IPM is a sustainable approach to managing pests by combining biological, cultural, and chemical tools in a way that minimized economic, health, and environmental risks. IPM programs emphasize preventative, ecologically-based methods first. If monitoring indicates that pesticides are necessary, they are applied according to established guidelines while minimizing risks to human health, the environment, and non-target organisms. There are five essential components of an IPM program, including: 1) Understand the ecology and dynamics of the crop; 2) Understand the ecology and dynamics of the pests and their natural enemies; 3) Institute a monitoring program to assess levels of pests and beneficial insects; 4) Establish an economic threshold for each pest; and 5) Consider available control techniques and determine which are most appropriate. 16. What is the difference between Integrated Pest Management and Organic? Organic also utilizes an Integrated Pest Management approach described above; however, if pesticides are necessary, growers may only apply materials that are included on the National Organic Program’s (administered by the US Department of Agriculture) list of organically approved materials. While these organically approved materials can also have impacts that must be minimized by growers, they are usually environmentally softer materials. The two approaches are not mutually exclusive. For instance, IPM strategies are also used by organic growers to help them apply organically approved pesticides carefully and only when necessary. In addition, many sustainable growers also use organically approved pesticides; in fact, the fungicide/miticide sulfur is the most widely used pesticide in California vineyards.